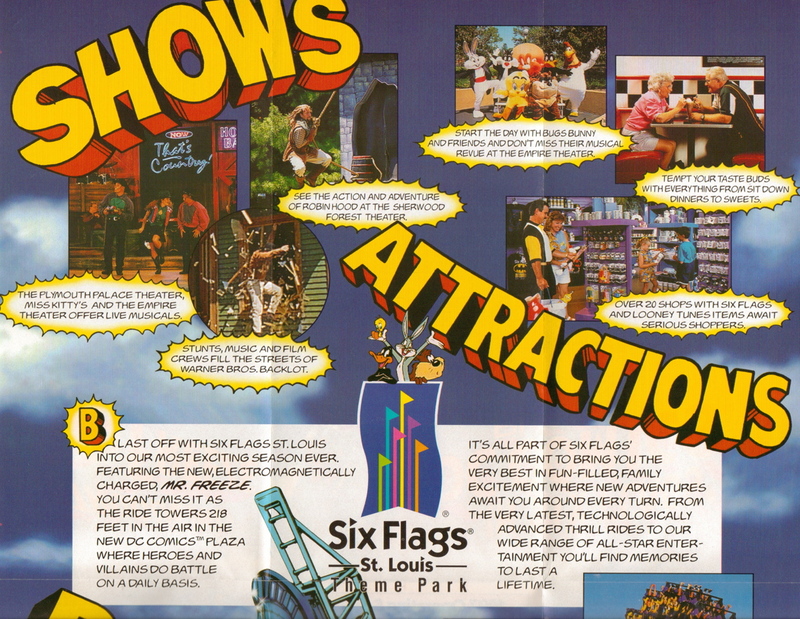 Six Flags St. Louis had big news for the park's 1997 season, they would be premiering a huge new launched coaster, one of the first of its kind. 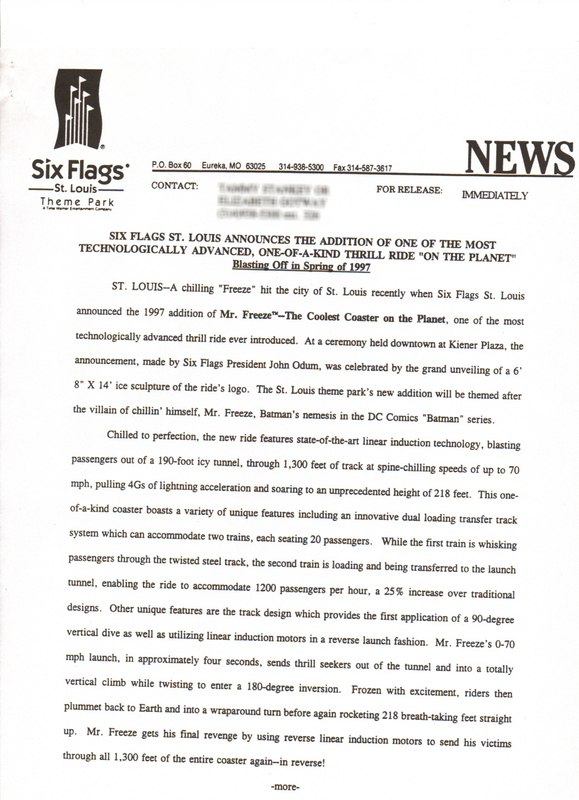 Exciting news, but a pretty disappointing reality followed for the park that year. The new ride was Mr. 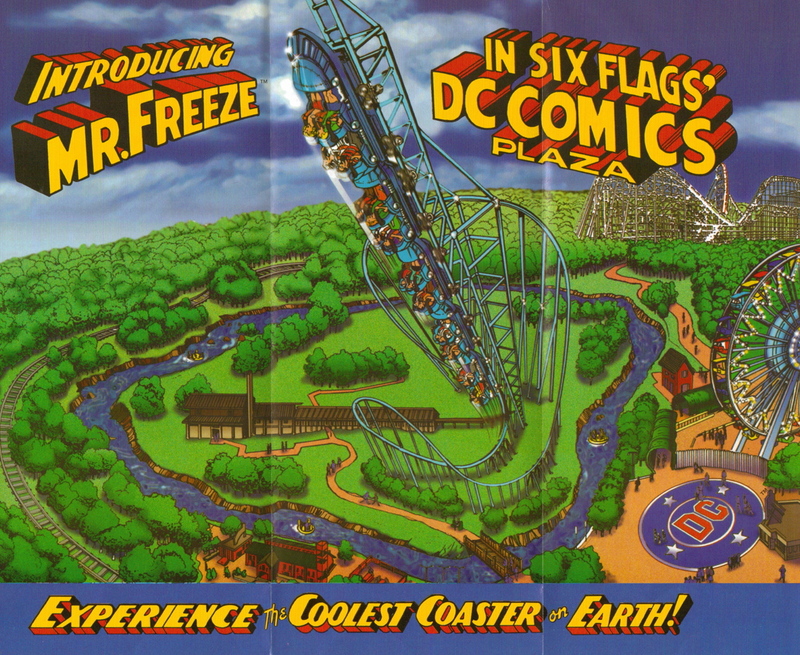 Freeze, the Coolest Coaster on the Planet. The ride utilized a LIM launch to get the trains blasting out of the station at 70 miles per hour. Those LIMs proved to give the park a bit of difficulty, however, and in the end Mr. 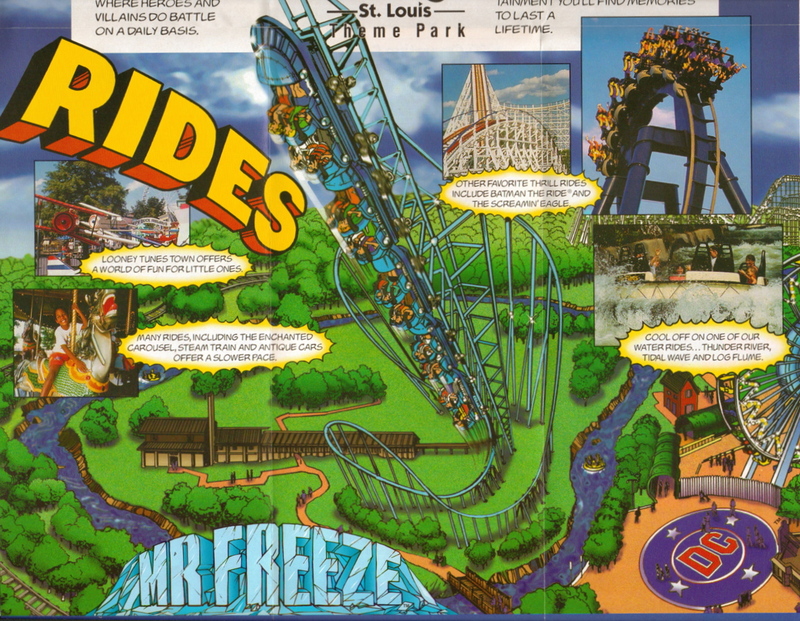 Freeze ended up being the park's big 1998 attraction. But the ride sure did have some nice concept art! The ride has a 218 foot tower that the trains head up, until gravity slows them to a stop. Then they fall backwards and repeat the course backwards. It is weird to write "trains" when speaking of a shuttle coaster, but due to a track switching mechanism in the station Mr. Freeze manages to run two trains at once. Wait! 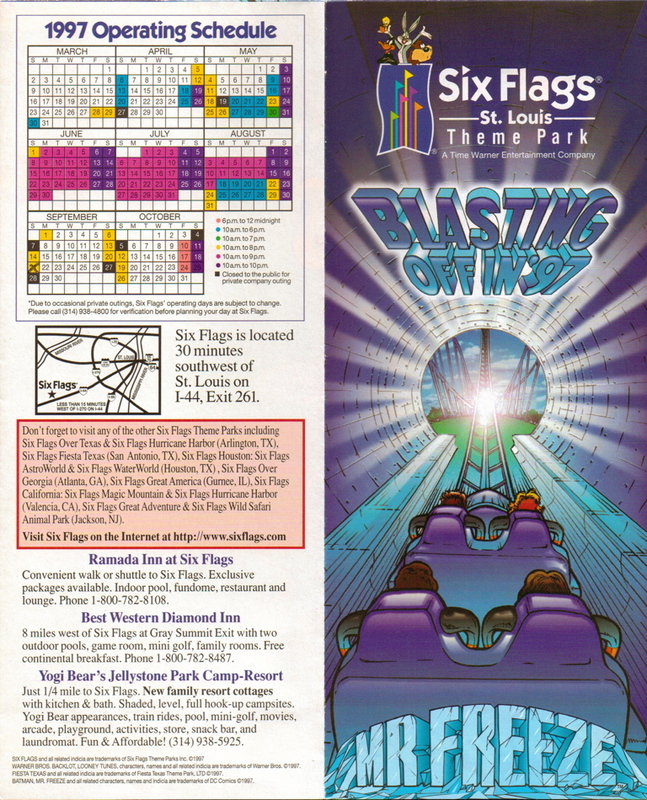 Unfold one more sleeve of this brochure and there's even more to that concept art! 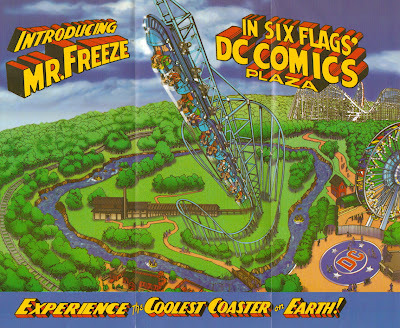 The ride was placed in DC Comics Plaza, which if memory serves correctly was created as a small area around the ride's entrance. 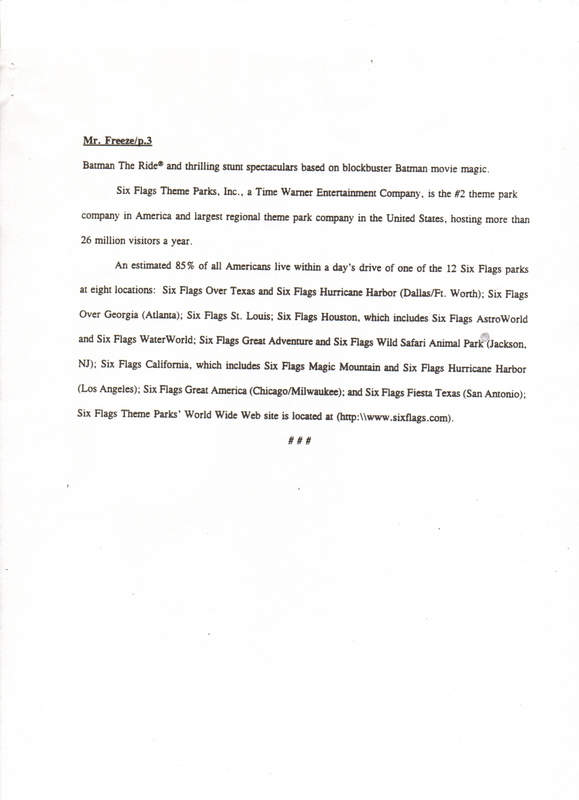 Also note that the entire coaster was built on the island created by the park's river rapids ride. Cool. It is good that since Mr. 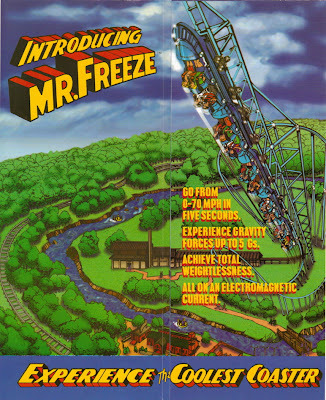 Freeze was a flop in 1997 that the park already had a big selection of rides and attractions in existence. I like the continued comic book style used here, consistency is our friend in life. I miss some of the types of things you used to find at Six Flags parks - take for instance the stunt show it looks like they had at the Sherwood Forest Theater. 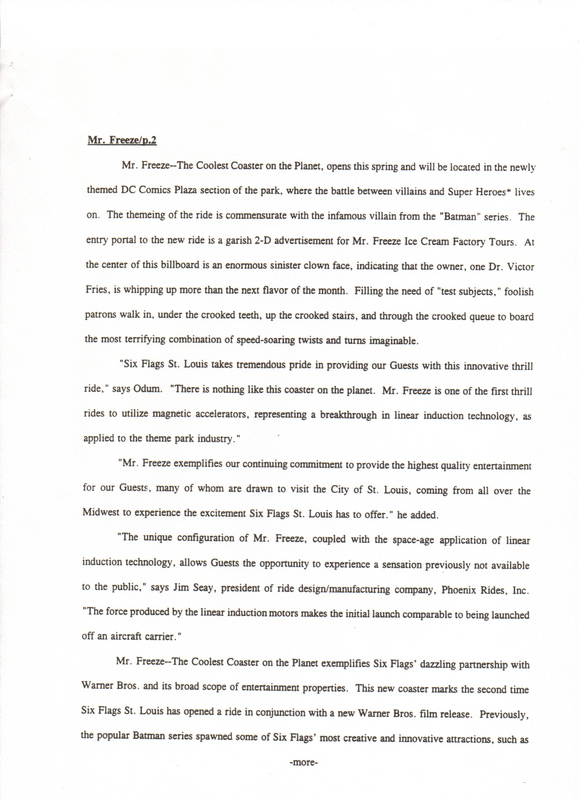 Pretty hard to find a good stunt show at any Six Flags parks these days. 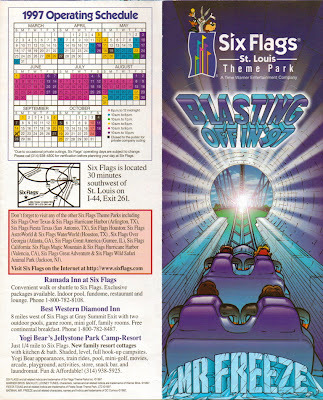 There's a bit of a focus on theme present in the brochure that's very hit or miss at the park these days also. Okay. Now I think the use of the concept are is overkill. Three times in one brochure is really hammering it home! But yes, the park did have plenty of other rides to keep you busy while you check in to see if Mr. Freeze is running.